Upon correct startup you will be presented with the GUI. After a while you should see the configuration popup and eventually the stream from the camera. 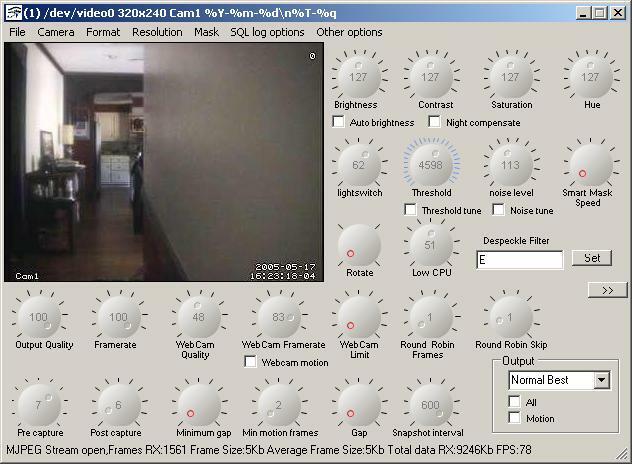 You will see a number changing at the bottom of the window this represents the size of each webcam image in bytes and can be useful when tuning your webcam quality setting. You can change the camera resolution by selecting Resolution then selecting from one of the defaults. For the change to take effect you will need to restart motion. left click on the image and draw. To remove right click on the drawn areas. Without having tested the actual software I must say that the concept and user interface you have created looks very intuitive and attractive. Nice tool , Could you release the source code too ? On this way many people will be able to contribute to this front-end. It doesn't work for me. I downloaded the net framework (actually the vesion 2) and this software locks up. Do you intend to release the source code? Thanks.